Romhacking.net - Review - By far one of the best LoZ hacks I've played since Outlands and Awakening of Onyx!!! This hack of The Legend of Zelda for the NES had nine months of hacking put into it, also it was made impressively using a Chromebook! if anyone is looking for a great new Zelda experience then this is the hack to download! This hack features, an entirely brand new overworld made from scratch, completely edited new (HARD) dungeons, challenging puzzles and gameplay, the Auto Map feature ~Thanks to snarfblam~, and ALL NEW completely edited graphics! All bugs have been fixed in this update, unless there are otherwise unknown bugs. ~Story~ In the peaceful land of Hyrule… Evil had begun to flow out of the hidden sacred realm. It was the evil of Ganon. The evil took the form of a dark mirror, and out of that mirror came the shadow of “The Hero”. Word got to the Princess Zelda that a mirror had appeared out of nowhere, Link’s shadow had come out of it, and that Link’s shadow had taken the mirror with him. Nevertheless Link’s Shadow used the mirror to create powerful shadow crystals that have the power to seal and unseal people and objects. He has placed the crystals in the hidden temples to steal the temple’s power. 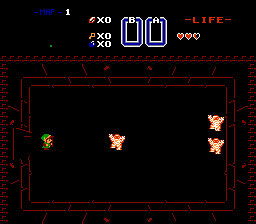 If the crystals steal enough power from the temple’s, then Link’s shadow can use the power to unseal Ganon! Find the crystals in the hidden temples before it’s too late, and use the crystals power to seal the mirror away! 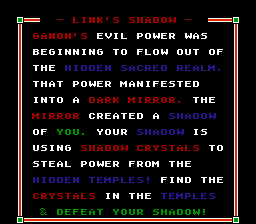 But before that Link must defeat his own shadow! By far one of the best LoZ hacks I've played since Outlands and Awakening of Onyx!!! Wow, Googie, you’re so right: this Legend of Zelda hack’s truly a masterpiece! I’m not even halfway through the first quest yet, but that’s because most of the dungeons are very well hidden or completely out of reach, but when you do find one, they’re no joke! Big hint: watch out for some rooms within level three, they’re a doozy! Definitely come as prepared as possible for that dungeon. Hold up, I can’t imagine how hard dungeons five through nine and then the following nine in quest two will be, yikes! Even with the stepped-up game difficulty, I’m in love with this beautifully and richly redesigned world. 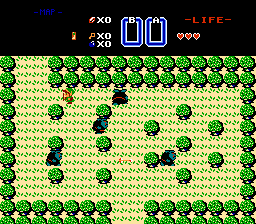 It really brings Link back to life again because each screen and all of the elements within each one have been worked on in great detail, so you’re definitely in a completely new quest. This hack easily rivals the brilliant and outstanding ‘Outlands’ and is in league with both it as well as another fantastic hack, the ‘Legend of Zelda: Awakening of Onyx’! And if you haven’t played either of those two, what are you waiting for? But if you already have, you already know how good this hack’s going to be. Seriously guys, I cannot recommend this one enough. It’ll have you hunting for treasures all over new lands and fighting for your life and princess in the process! By all means play it, savor it, and then review it like I did. I promise you won’t be disappointed with its phenomenal feel and gameplay! When I reviewed the author’s previous hack, I did say I’d look forward to more good hacks from that author and boy, I am so not disappointed, kudos. I never ever expected something so well detailed and unexpectedly challenging!